Jul. 21, 2014 5:00 p.m. The rules of lawn bowling are relatively simple, but the execution of them can create a complex game. Barb Taylor of the Langley Lawn Bowling Club will be competing in this yearâ€™s BC Seniors Games, to be held in Langley in September. Sheâ€™s been playing on and off for about 15 years, and she likes the game for its difficult technical challenges and constant changes. â€œItâ€™s always challenging,â€ Taylor said. Lawn bowling is similar to a whole family of games that includes bocce, and which date back hundreds of years. In lawn bowling, the first player tosses out a small white ball, the jack. The object is for the players to get as many balls as possible close to the jack by the end of the match. Scoring is similar to curling â€“ teams or individuals gain points for every ball they have in proximity to the jack, until one of their opponents balls is closer. 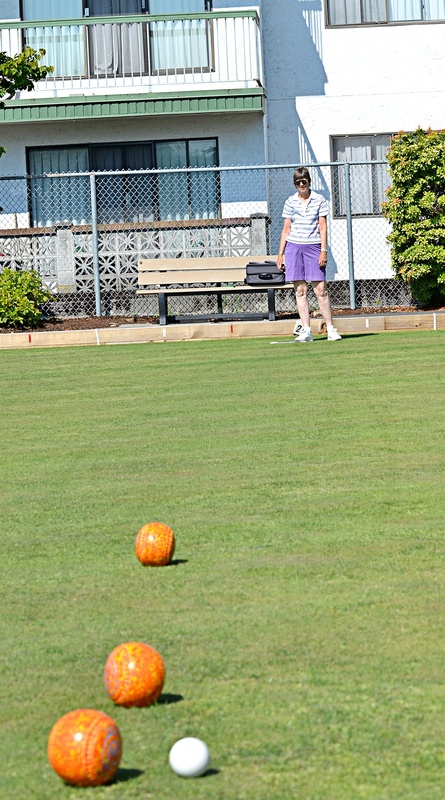 The difficulty for lawn bowling is that it is legal to hit and move both the jack and other balls during play. Shallow ditches mark the end of the playing green, and while itâ€™s legal to knock the jack into the ditch, any balls that fall in are considered out of play. The balls, dubbed bowls, are not perfectly spherical and are weighted to one side, so they move in arcs rather than straight lines. Added to that, said Taylor, is the fact that even the playing surface itself will change during a single match. â€œThe grass changes,â€ she said. Moisture and dew will dry out and affect the way the bowls move. Lawn bowling is played with singles and teams of two, three, or four players, in all-men, all-women, or mixed groups. When playing in teams, each member takes turn throwing three bowls against their opponent before retiring from the match. The last players, the skips for each side, will have to get the best position and grab the points. â€œThe skip controls the play,â€ said Taylor. Langelyâ€™s club, as the host for this yearâ€™s BC Seniors Games competition, will be putting a number of teams into the fray. With the Games in her backyard, Taylor decided to get involved for the first time. She said sheâ€™ll be playing to win. â€œWeâ€™re very competitive,â€ she said. That isnâ€™t true for every lawn bowler. â€œA lot of people arenâ€™t, theyâ€™re social bowlers,â€ she said. The BC Seniors Games take place this year from Sept. 9-13.